Faculty will share their expertise on service-learning abroad, cerebral palsy and Down syndrome interventions, and more at the Combined Sections Meeting, the largest U.S. physical therapy conference. 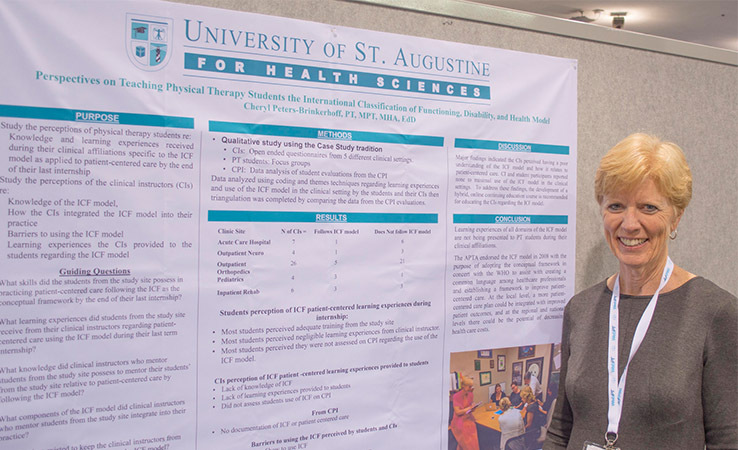 New Orleans – January 29, 2018 – The University of St. Augustine for Health Sciences (USAHS), a leading graduate institution that emphasizes health and rehabilitative sciences education through innovative education, will have several faculty presenting research at the American Physical Therapy Association Combined Sections Meeting (CSM) Feb. 21-24 in New Orleans. CSM brings together more than 12,000 rehabilitation professionals from each specialty area for the largest conference on physical therapy in the United States. The university will also have a booth (#1405) with information about its graduate degree and continuing education programs. Alumni and faculty are invited to the annual university social on Thursday, Feb. 22, from 7 to 9 p.m., at the Hilton New Orleans Riverside, Canal Room. Alumni may RSVP at usa.edu. Feb. 22, 3 to 5 p.m.
Feb. 23, 3 to 5 p.m.
To schedule an interview with a USAHS faculty member or for more information about their research, please contact Eric Brosch at [email protected] or 813-476-9782.